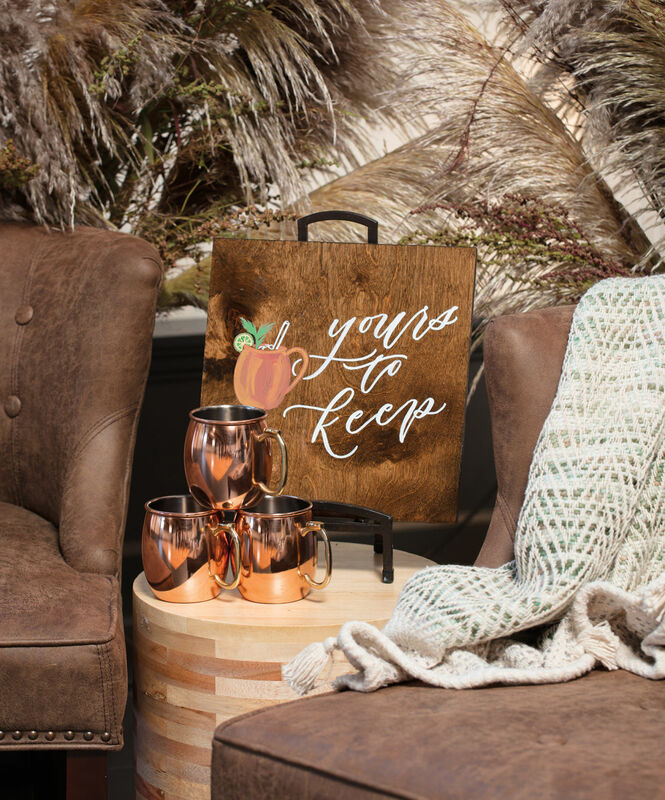 Feathery grasses mixed with warm mums, garden roses, and celosia from Solabee and cozy lounge chairs from Vintage Meets Modern create a chill space for guests to kick back with a cocktail from My Bartender (the Moscow mule mugs double as a wedding favor) while they wait for the festivities to begin. 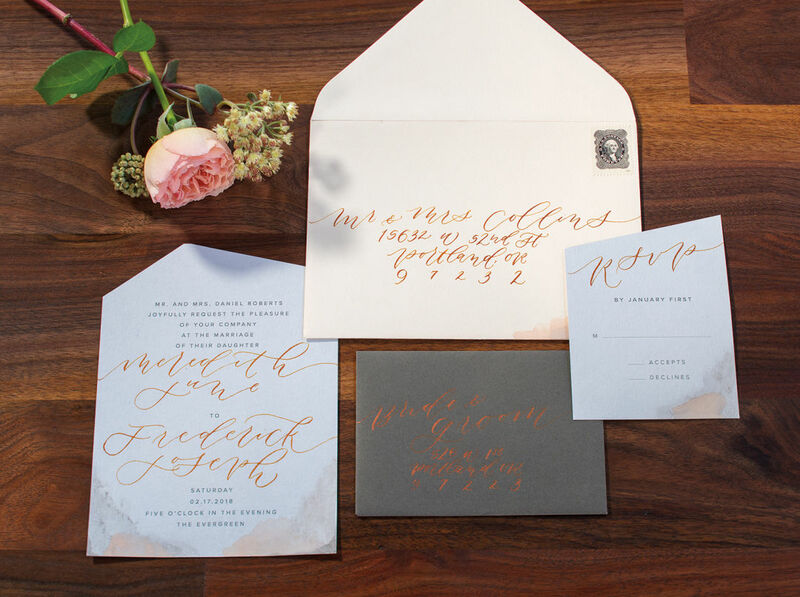 Opulent calligraphy meets modern, geometric edges in this hand-lettered paper suite from HeyHalle. 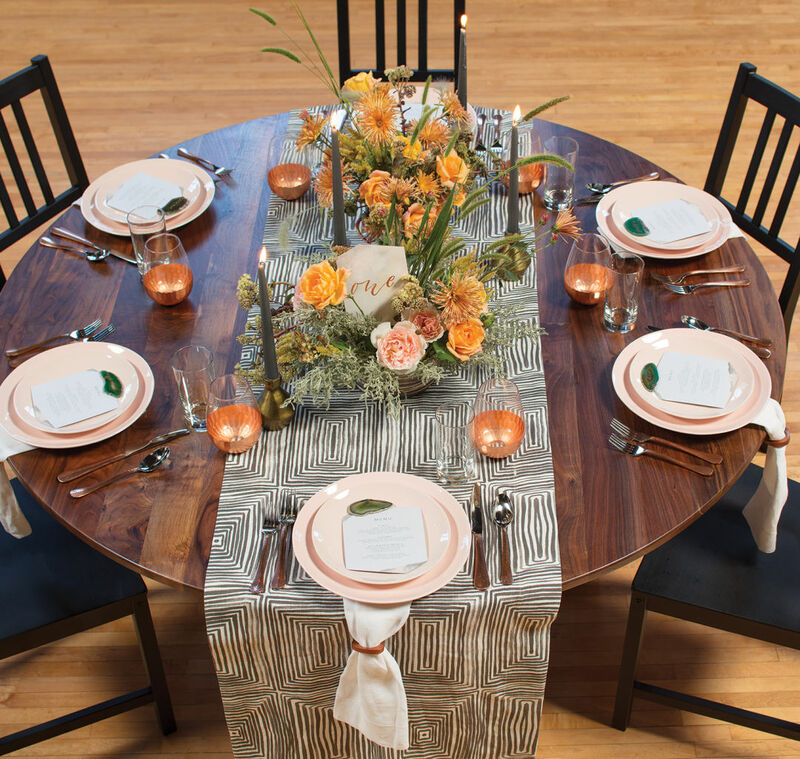 “We love texture and patterns,” notes the duo, “so whenever we have the chance to bring in striking patterns, we do it!” Combining a bold table runner with pastel dishware and copper-bottomed wine glasses, CK Events takes the farm-table wedding trend to the next level of reception design. Eye-catching textures and patterns continue onto the desserts table—Cat Sewell of Sewell Sweets Artisan Cakes in Newberg whipped up her modern, multi-tiered cakes using hand-painting techniques and her hallmark edible sugar flowers (each one can take upwards of 4 hours to create!). 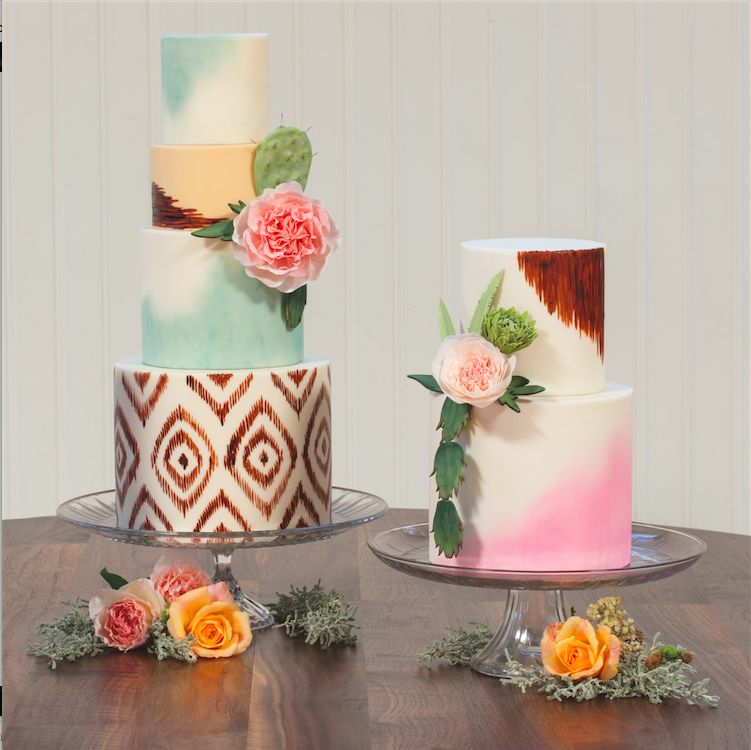 Who says prickly cacti and Southwestern textiles can’t be turned into fancy wedding cakes? Groomsmen gifts on full display. 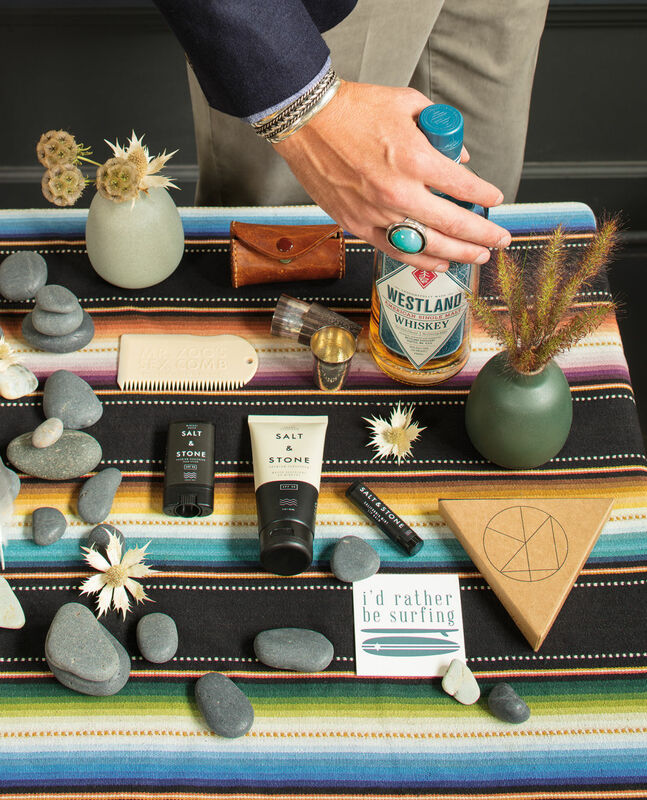 “The La Tavola linen was a wonderful backdrop to all of the smartly packaged grooming products from Salt & Stone,” says Wilder. “And that Palo Santo Surf Wax? Having that on my board and going out to catch waves in the Oregon surf are what dreams are made of!” On him: Large oval turquoise ring and stainless steel cuff, both at Maloy’s Jewelry Workshop. 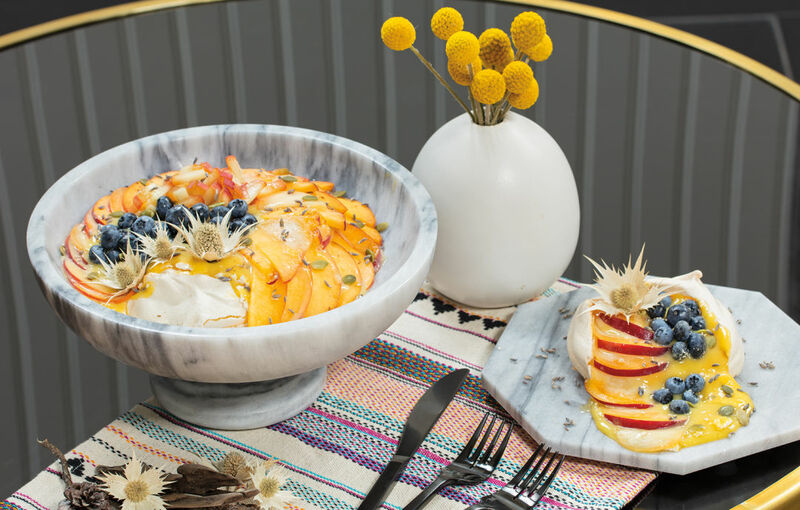 A lemon custard-filled pavlova from Heart of Celebration topped with Oregon blueberries, peaches, and lavender. 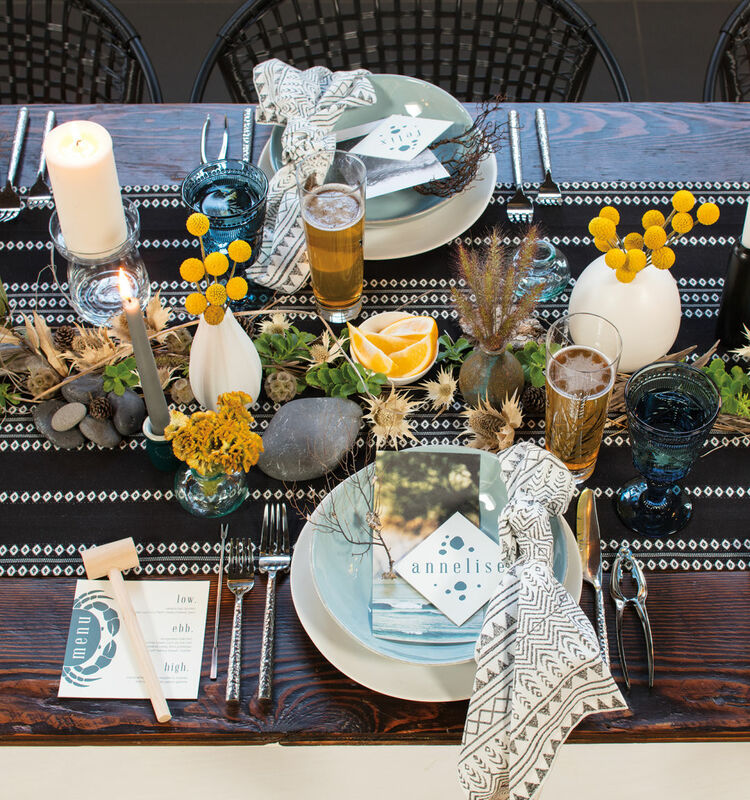 Wilder clipped pages from a surf mag to complete each place setting. 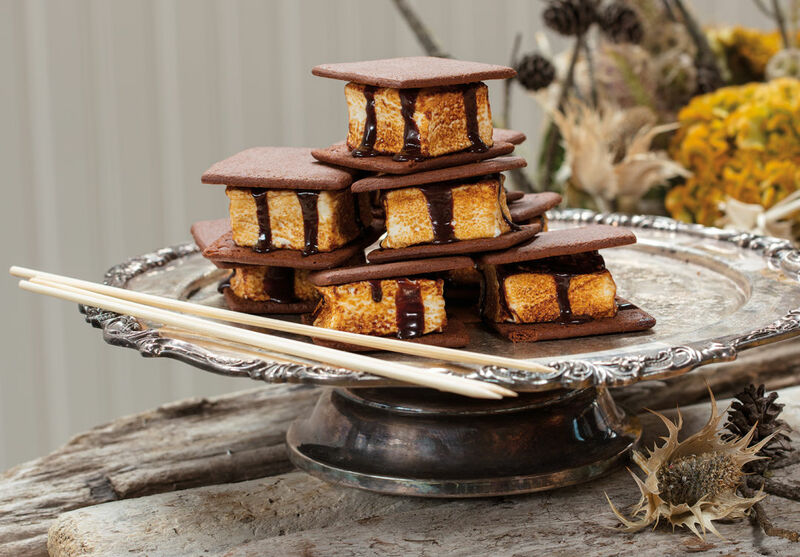 “I was looking through different surf magazines and saw these gorgeous photographs on every page,” she says, “and thought it would really tie the whole design together to use them on the plates to draw visual interest.” For dessert, fancy s’mores from 1927 S’Mores (think torched Oregon raspberry marshmallows and bittersweet chocolate fudge sandwiched between cocoa grahams) offer a nod to evening campfires in the sand. 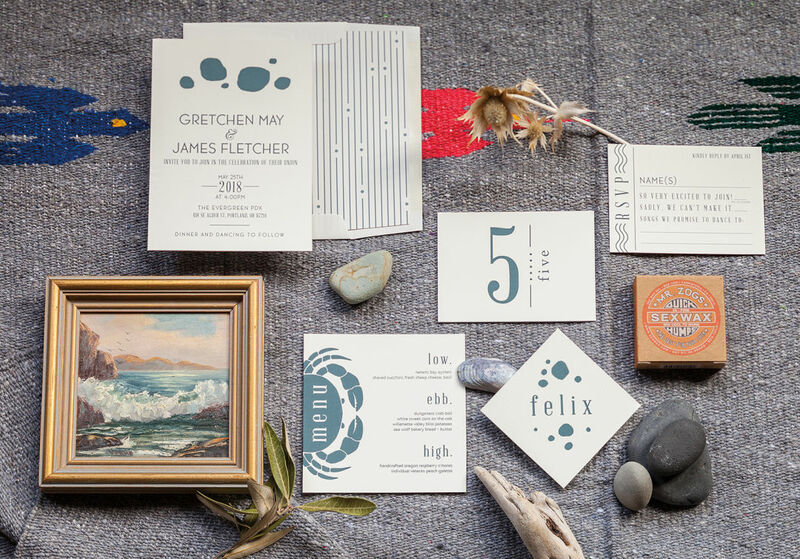 Darling Press’s nautically themed paper suite blends modern typefaces and simple imagery to highlight a clean, coastal feel. 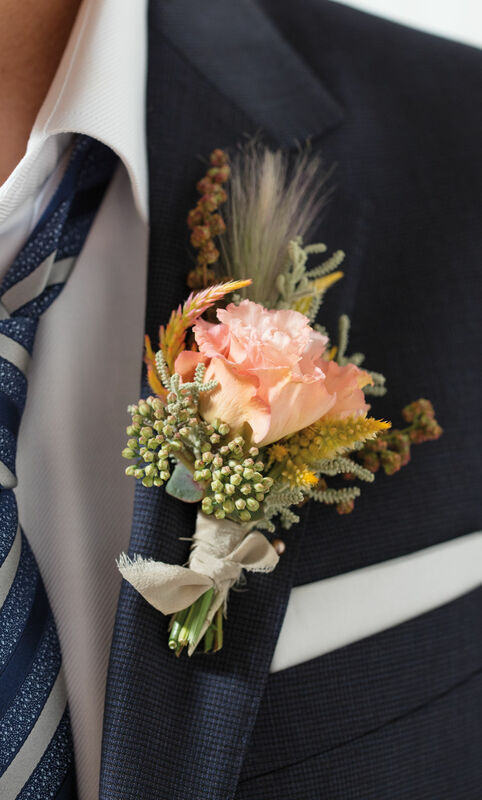 Floral arrangements don’t need to be full of color to make an impact. 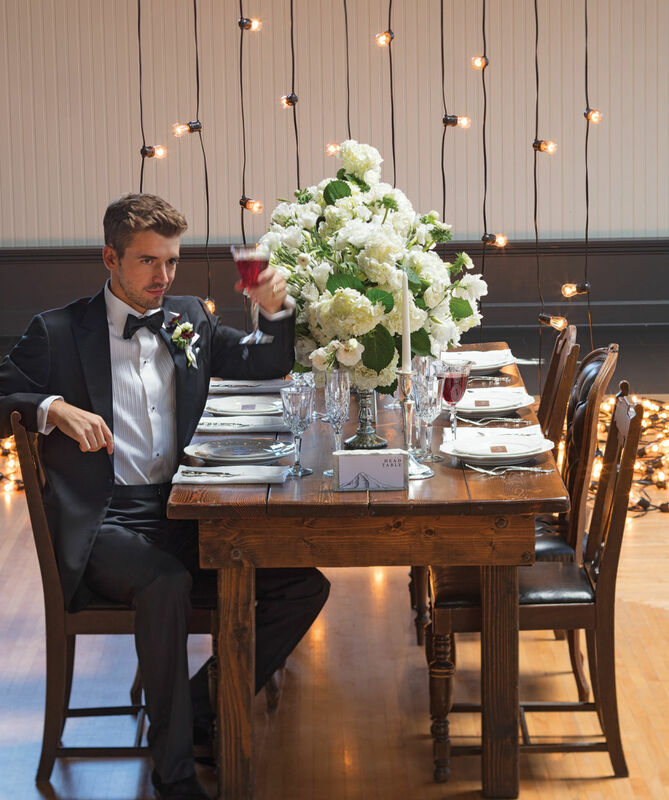 Here, a cascade of hydrangeas, ranunculus, lisianthus, and anemones from Fieldwork Flowers creates a sculptural statement atop the long, wooded table from Classic Vintage Rentals. “It’s dramatic, white, and super chic,” says Hoppins. 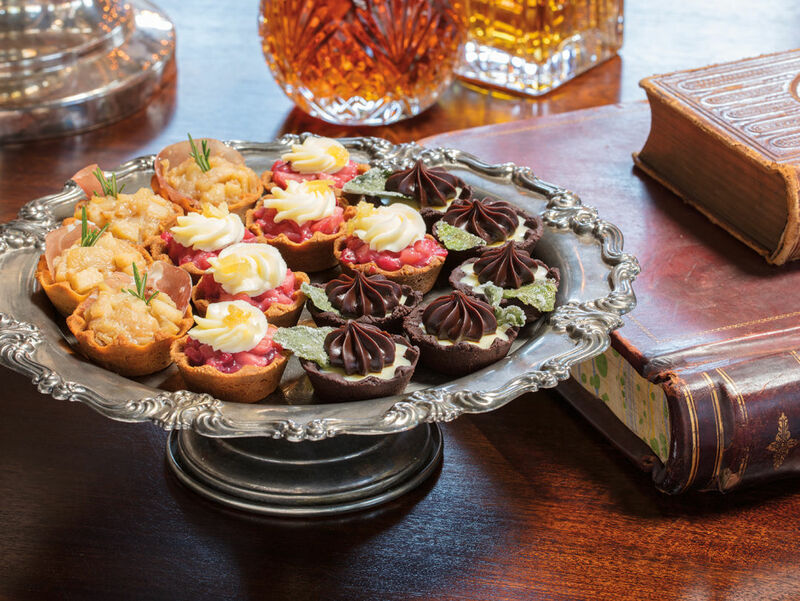 Chocolate-peppermint, apple-ginger-cranberry, and savory pear mini pies from Annie Pies offer guests end-of-the-night bites of both salty and sweet. 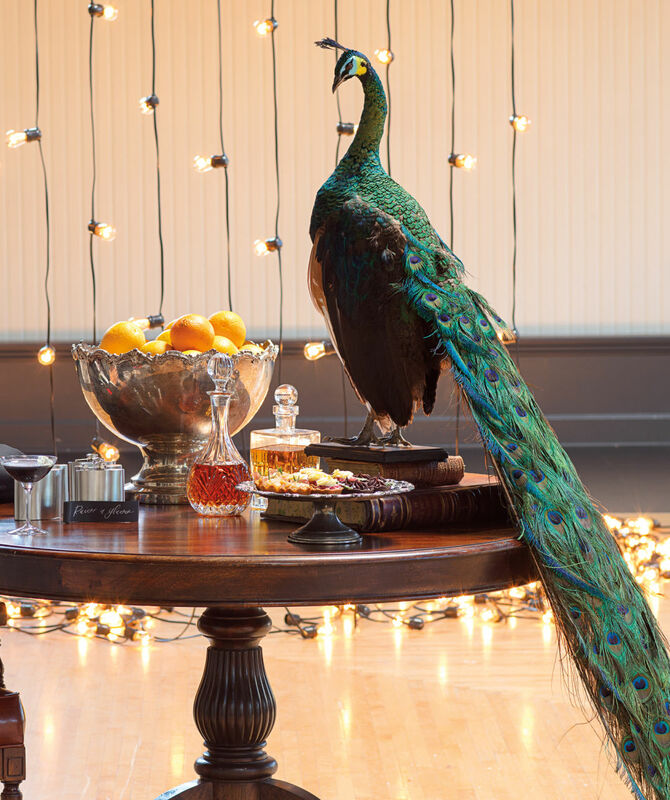 Drawn to unusual and unexpected touches, Hoppins says her goal is to “always create moments that surprise and delight the guests.” Enter Petey the taxidermied peacock. “I’ve really been into exotic birds and taxidermy, so I wanted to track down something that would fit this vignette.” Paxton Gate, the curiosities shop on N Mississippi Avenue, had just the creature. 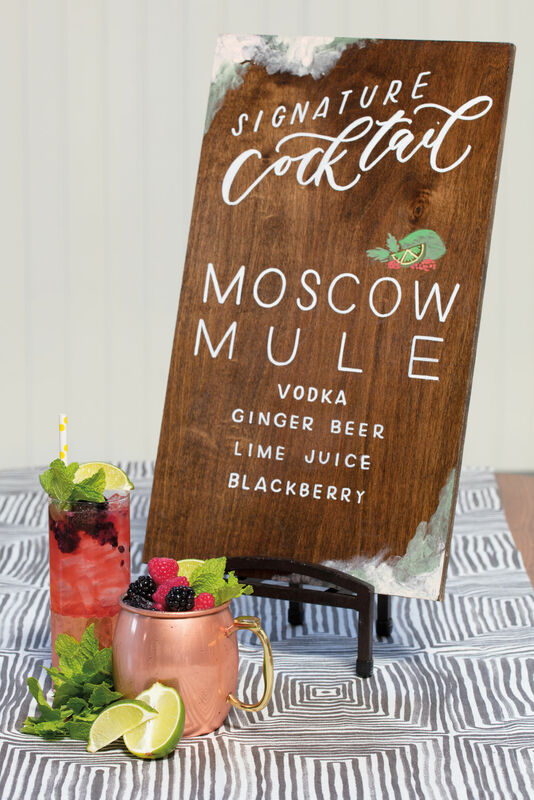 Showcasing him on the desserts and drinks table lends both color and a fun whimsy to the scene. As for the glam glow, "the puddle light installation by Greenlight Creative—evocative of snowfall just after dark—created the perfect backdrop for this tableau," says Hoppins. 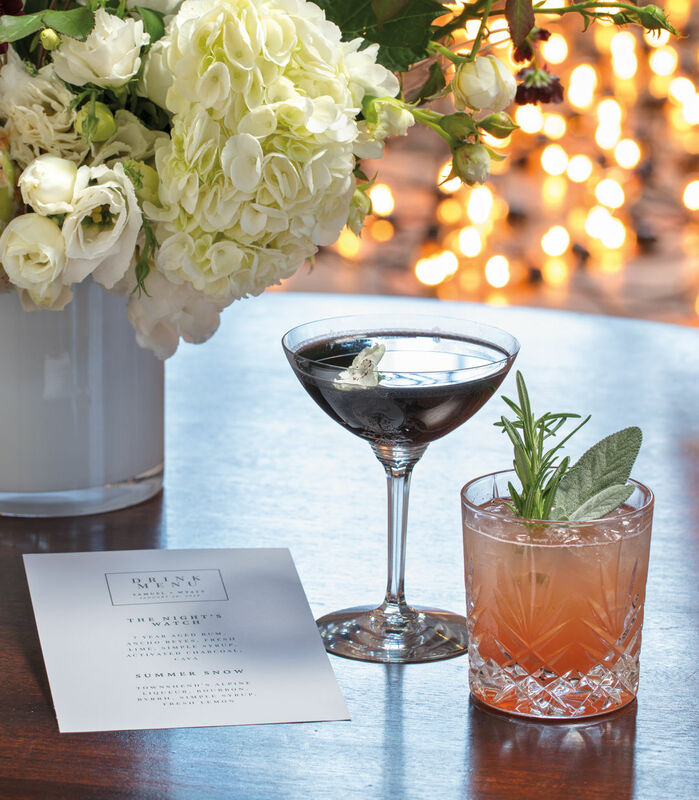 Cocktails from Merit Badge, including the Night’s Watch with aged rum, chile liqueur, citrus, activated charcoal, and cava, and the Summer Snow with Townshend’s alpine liqueur, bourbon, and citrus. 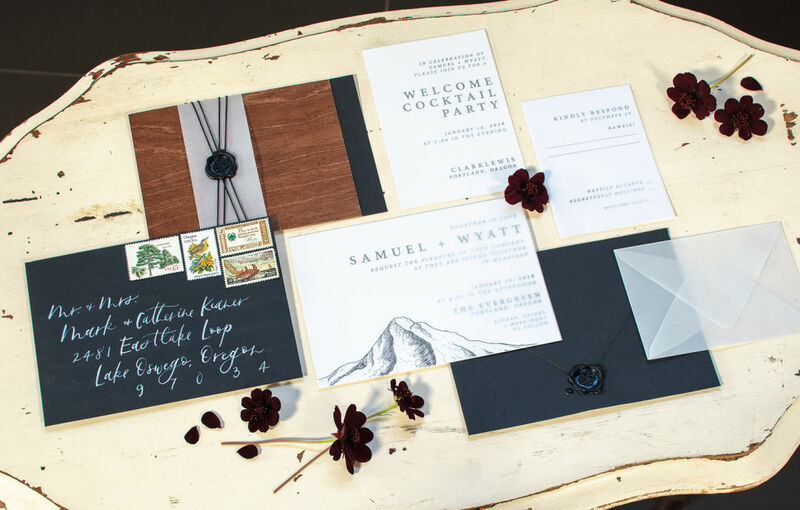 The mountainscape paper suite by Molly Arrene features a hand-drawn outline of Mt Hood, silver calligraphy, vintage stamps, and a custom stained-wood suite cover. 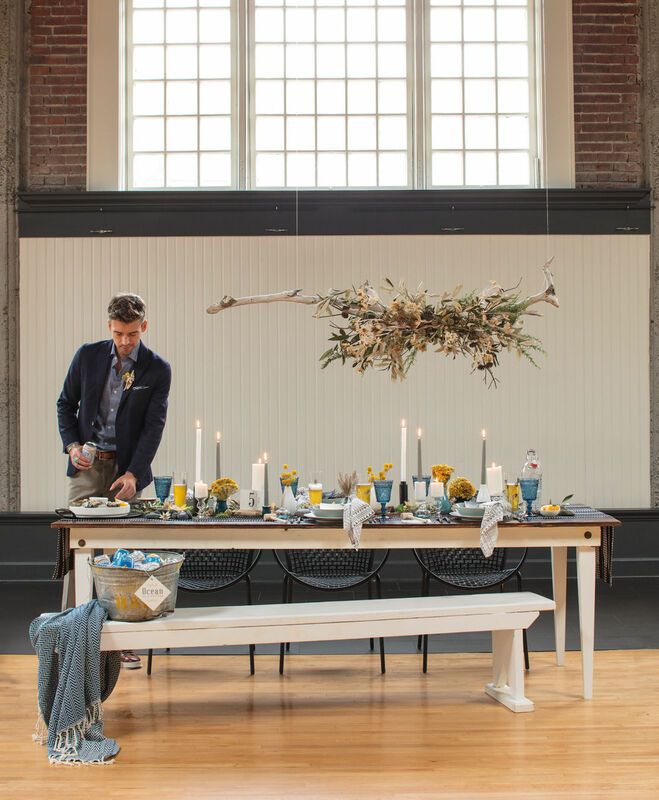 The once-dilapidated warehouse space above inner Southeast’s Loyal Legion beer hall is now an open and inviting ballroom, thanks to a recent overhaul. Warm brick and white wainscoting meet dark, modern tiles, pine floors, and sky-high windows (hello, natural light! 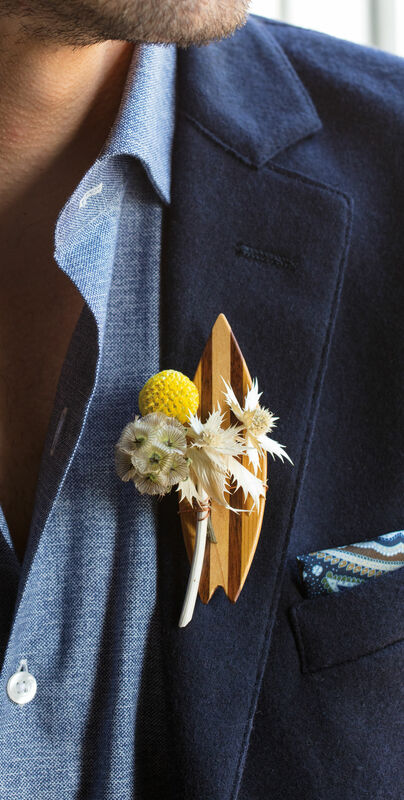 ), making it the ultimate blank canvas for a celebration confined only by your imagination. 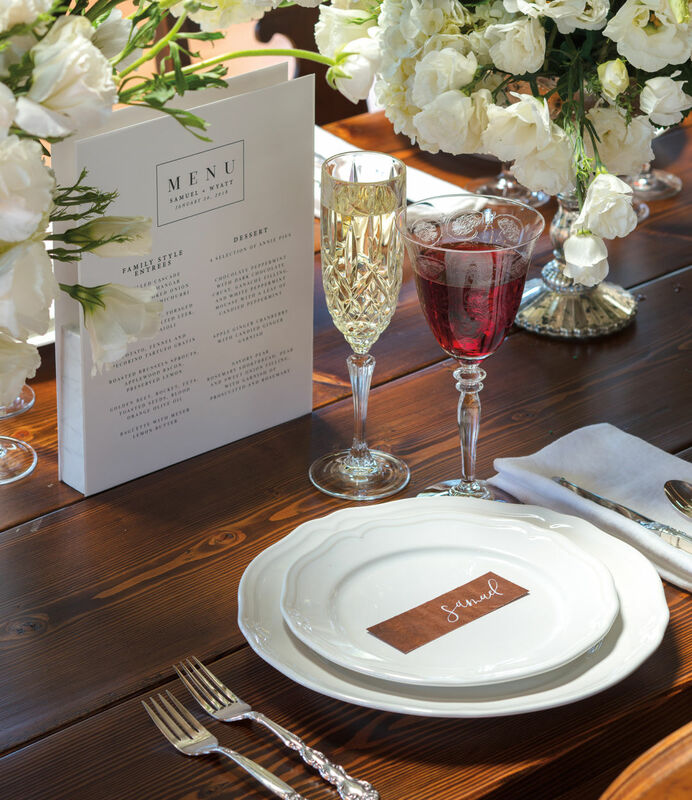 And with a capacity that reaches up to 550 people standing, and 200 for a seated affair, rest assured you can invite your nearest and dearest … and then some.